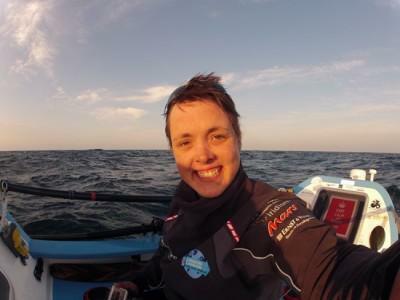 British adventurer Sarah Outen has run into a bit of trouble on her London2London Expedition. As you might recall, Sarah is attempting to circumnavigate the globe completely under her own power and has already paddled across the English Channel and ridden her bike across Europe and Asia as well. A few weeks back she started the next phase of her journey, a solo row across the North Pacific. But a tropical storm named Rosie has hit that area and now the Japanese Coast Guard is en route to render some aid. The storm actually hit Sarah yesterday, but not without advanced warning. She and her weather team had been tracking it for a week, and Outen did her best to prepare her little boat, Gulliver, for the impact. Still, Rosie packed a punch, bringing winds in excess of 55 knots (63 miles/101km) per hour. As a result, the rowboat rolled more than once and has sustained some damage, although just how much has yet to be determined. After a very rough day, Sarah turned on her emergency beacon and a Coast Guard aircraft flew over her position to assess the situation. She is safe and in good health, but will need to be picked up and brought back to shore so that Gulliver can be repaired. A ship is expected to rendezvous with her sometime tomorrow. This set back will obviously cost time and money and Sarah was hoping to cross the Pacific in the height of summer. Whether or not that can still happen will depend on how long it takes to repair the boat. Hopefully this will be a brief delay at most and she'll back on the water soon. For now, it's good to know that she is safe and sound.